100 gram UBS gold bullion bar. Each bar contains 9999 fine investment grade gold. Bars come sealed in a blister certicard. Each bar contains the UBS logo, the size, metal, fineness and Swiss metal stamp on the bottom. The serial number is located on the certicard. 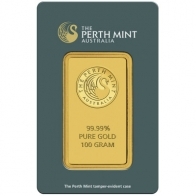 The UBS gold bars come in 100 gram, 250 gram 500 gram and 1 kilogram sizes. 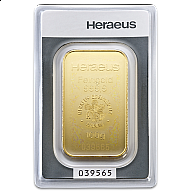 The UBS gold bar is manufactured for the bank by Argor-Heraeus, one of Switzerland's most prominent precious metals refineries. 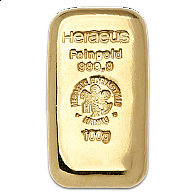 UBS bars are available in gold, silver, platinum and palladium. 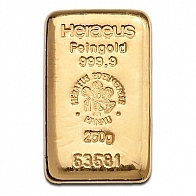 Based on availability, Heraeus, PAMP or Valcambi may be supplied in its place.